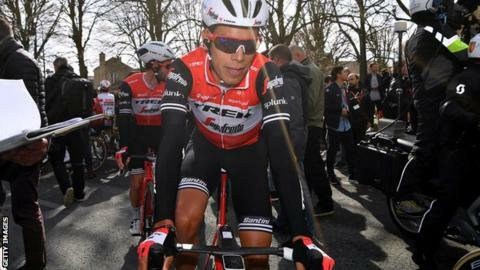 Colombian rider Jarlinson Pantano has been suspended by cycling's world governing body after testing positive for a prohibited substance. The UCI says Pantano was notified of an adverse analytical finding of erythropoietin - a form of banned blood-boosting hormone EPO. It came from a sample collected during an out-of-competition test on 26 February. The 30-year-old has also been suspended by his team Trek-Segafredo. "We hold all our riders to the highest ethical standards and will act and communicate accordingly as more details become available," the team said in a statement. Pantano, whose most notable career victory is winning stage 15 of the 2016 Tour de France, has the right to request and attend the analysis of the B sample.